Running a marathon? Needing a burst of energy? Forget bananas for stamina and glucose drinks for a quick boost. Have a packet of potato chips! Not just ordinary chips, though, NRG Potato Chips! With added Taurine (which does bugger all despite what the likes of Red Bull claim), Caffeine (which interferes with the body's ability to absorb a whole range of minerals), and B-vitamins (which you get plenty of in your normal diet, not least your morning Corn Flakes). It's not junk food, honest! And if you eat them when you watch TV it's the calorie-burning equivalent of actually running a marathon! ps A good source of B-Vitamins is non-filtered beer! While filming in a city office last week I happened upon a Klix machine. Now, I'm fascinated by Klix machines, because it amazes me that any of their machines are sold; the tea and coffee tastes the same - a very unpleasant hybrid mix of both. They also dispense Cup-A-Soup, and "Starbust Orange" which has all of the "taste" of Bird's Appeal . 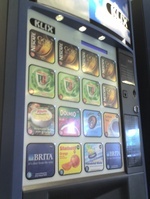 Need I say more about the contempt employers must have for their employees by supplying these machines instead of a kettle and some PG-Tips and Nescafé? 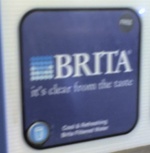 However, what caught my attention about his machine was the offering of "Brita" water. Now, if it was offering me "Volvic" water, I'd know it was mineral water from Auvergne in France. If it was "Buxton Spring" I'd know it came from a spring in the Peak District. And, if it was "Highland Spring" it came from the Ochil Hills in Perthshire, Scotland. So, where does "Brita" water come from? Well, it comes from whatever tap the Klix machine is connected to. What makes it "Brita" water is that it's passed through a Brita filter. Wow! They're selling a branded beverage, without actually having to ship the product. That's genius! When you get mixer Coca Cola in a pub, at least you're getting Coca Cola syrup (mixed with fizzed-up tap water). All Brita need to do here is supply Klix with some of their filters. And I'd imagine that Klix have to put filters in their machine's anyway. The power of the brand, eh? Got me thinking about how I could adapt this idea to my business. (I haven't figured it out yet...). When I asked if anyone would like to have a wager on how long it would take for Masterfoods, makers of the Mars bar, to abandon their bewildering decision to add liquidised cow's stomach to their chocolate, I didn't think it would be as quick as seven days. What a humiliating climbdown. Boy did I laugh. Never more have I so wanted to say "I told you so" to someone's face. It turns out that the Vegetarian Society had just contacted Masterfoods as part of a general enquiry about ingredients, and Masterfoods responded that they had already started adding rennet to their products at the beginning of May. What they meant by a "principled decision" was that they decided not to lie in their response to the Vegetarian Society, and their honesty should be respected. Why are Masterfoods behaving like they should get a medal for not lying? Was lying one of the options they considered? Where were Masterfood's principles when they decided to start adding animal by-products to their products without telling anyone. Where was their respect for vegetarians, or Muslims, or simply people who don't like the idea of bits of dead animals in their chocolate bars? Masterfoods have been quite rightly slapped down by the British public. I hope it inspires people to realise that corporations' wicked ways can be curbed by the power of public opinion. And I hope that heads roll at Masterfoods for the contemptuous way that they have treated their customers. Want to see the 2007 equivalent of the "New Coke" story unfold? Remember in 1985 when Coca Cola shocked the world by disaterously changing the recipe to Coke in response to the success of the Pepsi Challenge? It's considered one of the ten worst business decisions in history. Well, today, Masterfoods, makers of Mars Bars, Snickers and Twix announced that they have inexplicably started using animal products in their chocolate snacks. From 1 May, Masterfoods started using rennet, a chemical sourced from calves' stomachs, in the production of whey which is used in all of their snack and ice cream range. "If the customer is an extremely strict vegetarian, then we are sorry the products are no longer suitable, but a less strict vegetarian should enjoy our chocolate," said Paul Goalby, corporate affairs manager for Masterfoods. The Vegetarian Society have described the move as "incomprehensible". Masterfoods said that the switch was based on a "principled decision". Oh good, I'm glad is wasn't one of those "unprincipled decisions"! What is the principle that encourages you to ignore what the customer wants and values? Clearly this is a financial decision. I don't doubt that this decision is about shaving a fraction of a penny off a bar of chocolate. Not only will a bunch of vegetarian groups now boycot this product, but many other consumers will be disgusted by Masterfoods' arrogance. You don't have to be a vegetarian to not want liquidised baby cow's stomach in your chocolate bar. Anyone care to wager how long it will take Masterfoods to reverse this decision? I'll also take bets on how many millions Masterfoods will lose before they do so. And yes, they're off my shopping list. Them and Nestlé. Go to Hell (Pizza) President Bush! New Zealand pizza chain "Hell Pizza" are no strangers to controversy. While this poster certainly raised some eyebrows recently, in November 2006, they cause a greater stir when the Advertising Standards Authority (ASA) upheld 600 complaints against them for distributing 170,000 condoms and instructions on how to use them to promote their new "Lust Pizza (for meat lovers)". Family Life International, who had previously called on a boycot of NZ's C4 for showing the controvertial South Park episode "Bloody Mary", and the Catholic Church condemned the campaign as encouraging children to use the condoms and follow the "explicit instructions" contained in the packet and called for a boycott of the company. Hell Pizza's director Warren Powell refused to apologise for distributing the condoms. Powell said the company discussed the promotion with Family Planning and the Aids Foundation and they completely support the campaign. "While the primary aim of the campaign is to promote our Lust pizza, let's not forget that promoting the use of condoms has important public benefits." "Government and public agencies distribute these things for free to young people." "Before this campaign started we rang a number of these agencies and offered them our excess condoms at no charge." Bob McCoskrie, Director of Family First, responded to the upheld complaint "our message to Hell’s Pizza is simple – stay out of the bedroom and get back into the kitchen."